VRF is an extension of IP routing that provides multiple routing instances. It provides a separate IP routing and forwarding table to each VPN and is used in concert with MP-iBGP (Multi-Protocol internal BGP) between provider equipment (PE) routers to provide Layer 3 MPLS-VPN. However, ML-Series VRF implementation is without MP-iBGP. With VRF Lite, the ML Series is considered a PE-extension or a customer equipment (CE)-extension. VRF Lite is considered a PE-extension since its has VRF (but without MP-iBGP), and it is considered a CE-extension since this CE can have multiple VRFs and serves many customer with one CE box. VRF Lite means VRF without the need to run MPLS in the network. VRF Lite allows the network administrator to create multiple routing instances on the same routing device within the enterprise (for instance, it is possible assign the 10.0.0.1/30 IP address on two different interfaces). VRF Lite can be useful when you need to isolate traffic between two networks sharing the same routing platform or if you have multiple networks with overlapping addresses sharing the same physical network. Multiple instances of routing protocols can be used for different VRFs on the same device to exchange routes dynamically with a direct connected device. ip vrf vrf-name: make the instance of routing protocols. ip vrf forwarding vrf-name: associates the VRF-Lite with an interface or subinterface. 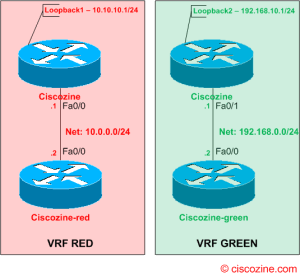 ciscozine: the router with two instances of routing (based on VRF-Lite feature), named ‘RED’ and ‘GREEN’. 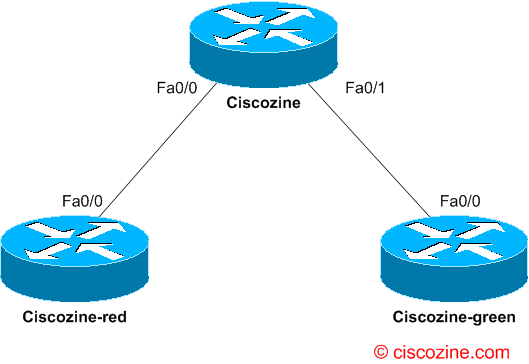 ciscozine-red and ciscozine-green: two router connected to the ciscozine router without the VRF-Lite feature. …the logical connection without VRF-Lite features (as you can see in the video, each host can ping the others). Use VRF-Lite on Ciscozine router is simple; it is required define two instances: RED and GREEN. The command to do it is: ip vrf ‘vrf-name‘. After that, it is needed ‘link’ the VRF-Lite to the interface using the command ip vrf forwarding ‘vrf-name’. show ip vrf: Displays the set of VRFs and interfaces. 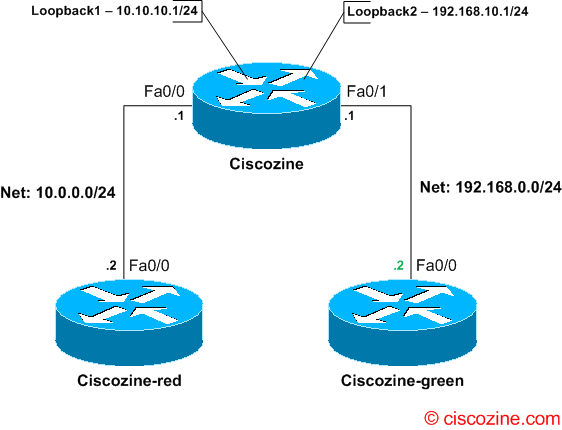 show ip route vrf vrf-name: Displays the IP routing table for a VRF. show ip protocols vrf vrf-name: Displays the routing protocol information for a VRF. 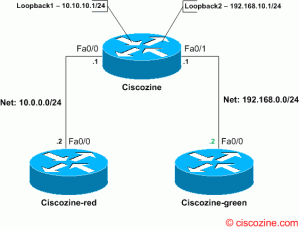 ping vrf vrf-name ip-address: Pings an IP address that has a specific VRF. VRF Lite allows the network administrator to create multiple routing instances on the same routing device within the enterprise.